Mel Stampz: .....Finally! 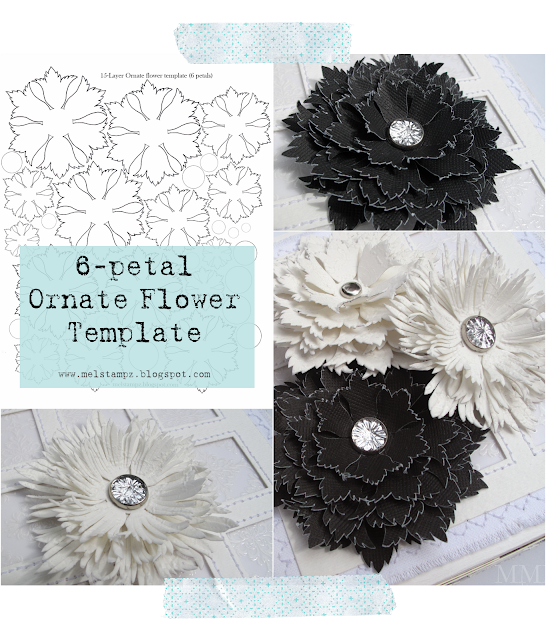 my free ornate flower cut file is back! .....Finally! 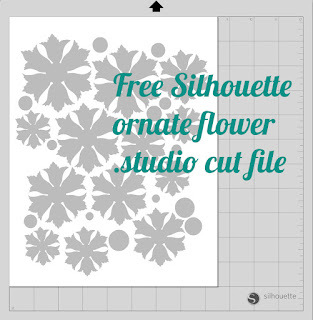 my free ornate flower cut file is back! Some good news to those of you who might want to use my 6-petal ornate flower cut file. I finally managed to retrieve the files! (Tragically I had lost my Silhouette library with the upgrade & lost all of my schtuff with a PC crash.) Now much of it is back, however, and here are the files in case you'd like them. Enjoy! Hope they work well for you! The white flowers have a soft flocked texture because they're made with cardstock that I covered with Golden's Light Molding Paste and then texturized with a wooden Batik block. 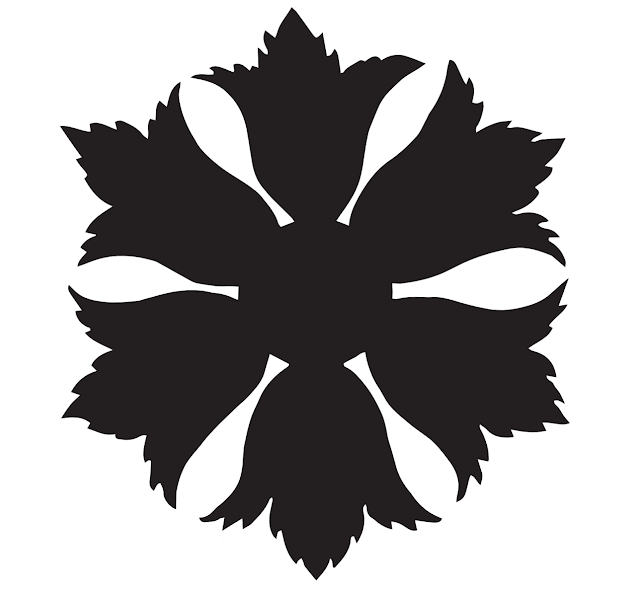 The black flower is made from Core-dinations cardstock. Thank you for sharing this file with us! O my word this flower is gorgeous. I have seen lots of flowers in my days but none I liked as well as this one. Thank you so much for sharing. I wonder how it would look as a poinsettia. These flowers are beautiful!! Thank you so much for sharing your talent. Wow, these are gorgeous Mel, thank you so much for sharing and inspiring. I love your card, great color combo and sooo much dimension. Wow, I'm like you! Lost 11,000 files when I upgraded to the Sil cloud version. They are somewhere lost in space. I had to go back to a pre cloud version of Sil and reloaded most of my files from a previous backup. Before that my computer completely died but the hard drive was ok so I was able to get some stuff back for my new computer.Still have been unable to get my pictures back! It's been a very frustrating experience. I do double backups just to be on the safe side. I love that we will be able to retrieve your files of which I used to have many. Starting over now. Thanks so much. Thank you so much for sharing these files! What a gorgeous flower! I am so sorry you lost so many files...technology is definitely a love/hate relationship. Glad you have retrieved much of it and hope you can find more. Hugs! WOW!! These are STUNNING!! Thank you for sharing!! Awww.... Your flowers are amazing!! 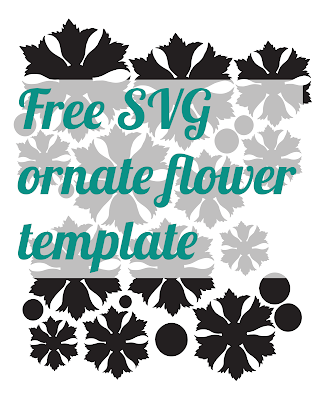 And you are so kind and generous to share the template for free! Thank You Mel!! I have to start using my Silhouette!!! How cool! Thanks so much, Mel! Love this! Hello Mel, oh goodness these flowers look amazing! 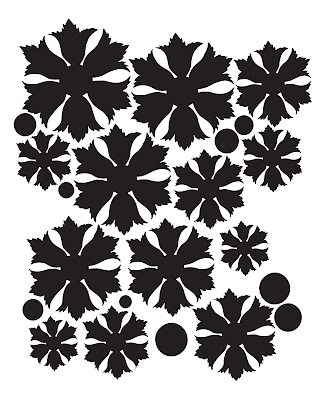 I love how you used them, especially the black with a bling center. Thank you for sharing these files!! Thank you so much for sharing your talent. Your flowers were beautiful. I can only hope my come out as lovely as yours. 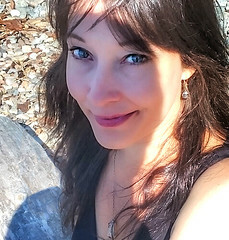 I so enjoy your blog. I've only been following for a short while, but love it. 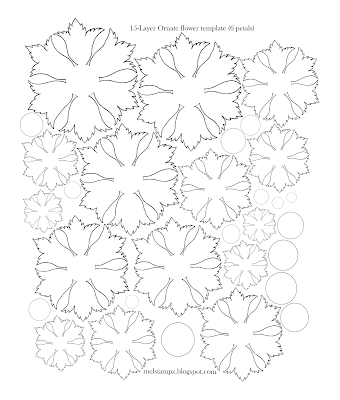 I have cut these out by hand now I'll try with my new cutter. Thanks and glad your back!